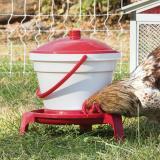 Used for watering poultry, including waterfowl. 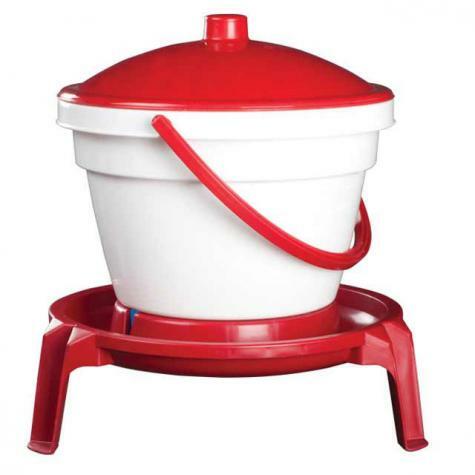 Waterer stands up and out of the bedding to reduce soiling. Has three legs to stand up and out of the bedding to reduce coiling of water tray. Legs elevate waterer 5". Simple design that's easy to clean and refill. To fill remove red lid and add water. Ideally refill with a hose because it's heavy to carry when filled to the top. Worked both indoors and outdoors. See the Installation Instructions above for replacement parts and assembly instructions. We suggest periodically dismantling and cleaning the unit to prevent hard water and algae build up from obstructing the float system. 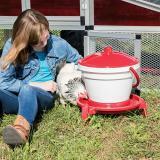 For proper function place waterer on a level surface. If used outside, the lid may blow off in strong winds. 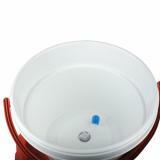 Replacement parts for Quick Clean Waterer (with legs), 3 gal. Number of reviews: 24 customers reviewed this product. Recommended: 23 out of 24 said they would recommend this product to a friend. 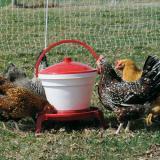 I got the 3 gallon easy fill waterer with legs and the lid. I totally love this thing! It is easy to fill and easy to clean! I put it up on some blocks of wood to raise it just a little to help keep the shavings out of the water. I keep it inside the coop because I have different water outside in pen. 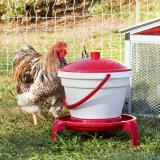 This is a great waterer! I think the 5 gallon one would be too heavy for me. I like to take it to the door step and tip it a bit and use a dish sponge to clean the trough every day. Very easy and 3 gallons is perfect! Water stopped flowing after about 4 weeks. Had to take it completely apart, remove algae, and re-assemble it. (Not really sure how that qualifies as "quick clean"!) A few weeks later, same problem and same cleaning regimen but it only worked for 2 days. I won't risk my chickens not having water. I wouldn't buy this again. Nice waterer. Had to retighten the nut to stop a slow leak. Sturdy construction and was surprised it was made in Italy. Plenty of water for my 5 hens. Would buy again. Nice 2 day shipping too! I am in love with the tripod legs, to keep it off the ground. Just the right size for the amount of chickens I have. Since the only directions was pictures of the unit it was a little confusing on how to assemble. You know that one piece that you think you know where it goes but then it falls out of the unit when you upright it. I found out the first day you have to make sure it is on level ground, if not all your water flow over the side and on to the ground and then you walk outside and see that the chickens have no water and you don't know why at first. When it is on level ground it works great!!! Love this! Works great and looks great as well!